Course outline: Expand your stretchy bracelet tool box by learning how to create them on the Endless Loom. Pamela Kearns will teach you how to judge your size and allow for ease of wear. This style of stretchy bracelet allows for more than one ‘row’ of beads and still not need to deal with a clasp. 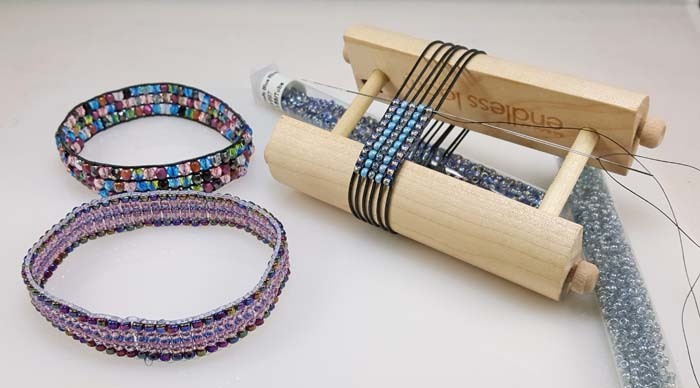 You’ll see finished bracelets in all three available loop sizes using various beads. By using size 8/0 or 6/0 beads in your design, you will be able to finish your bracelet during class time and wear it home! Bring to class: An Endless Loom, a package of stretchy bands for the Endless Loom (wait until class to purchase the bands! ), a spool of TOHO thread in your choice of colour; size 8/0 or 6/0 Japanese seed beads in your choice of colours; scissors; magnification if required. The instructor will provide a needle. Written instructions, pattern suggestions, big-eye needle.